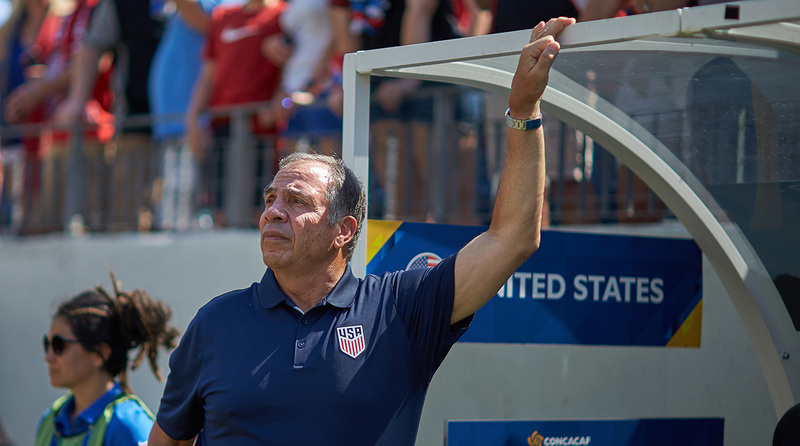 There's plenty of debate regarding the merit of the 2017 CONCACAF Gold Cup, but Bruce Arena's knockout-stage approach tells you all you need to know about how much it means to the USA. PHILADELPHIA — The jersey numbers suggest they’re superfluous, tacked on as they are to the end of the traditional 23-man list. Newer, younger, less impactful players often get the higher digits, and the half dozen men added to USA coach Bruce Arena’s CONCACAF Gold Cup squad as knockout-round reinforcements will have to make do with newly-assigned numbers reaching into the anonymous upper 20s. But these are not younger, less impactful athletes. Four of the six are future National Soccer Hall of Famers, and another is on the threshold of international stardom. Their effort to make the temporary numbers resemble the traditional is an indication they matter at least a bit. When they take the field here in Philadelphia for Wednesday’s Gold Cup quarterfinal against El Salvador, Michael Bradley will be wearing No. 26. That’s because 6-2 = 4. Clint Dempsey will be No. 28 on your team sheet. He’s No. 2 in Seattle and normally No. 8 for the USA. And Jozy Altidore opted to add 10 to his customary No. 17. The last time a Gold Cup game was played at Lincoln Financial Field, Mexico defeated Jamaica, 3-1, and clinched its seventh tournament title and 10th regional championship overall. That 2015 milestone mattered, as did every step along the way. El Tri celebrates its successes. They won their eighth CONCACAF crown in 2009, thumping a junior varsity USA squad, 5-0, in the final at the Meadowlands. You can always find mitigating circumstances if you look for them. Maybe Mexico shouldn’t have reveled in that triumph because of the nature of the opposition (coach Bob Bradley’s first-choice US team contested the Confederations Cup that summer). But a couple weeks later outside the Estadio Azteca in Mexico City, where El Tri was hosting the Americans in a 2010 World Cup qualifier, fans were proudly sporting green T-shirts trumpeting the 5-0 final tally. Winning traditions are forged by winning. And if chasing titles and lifting trophies wasn’t the point it all, it might make sense to stop keeping score. The 2017 Gold Cup comes with multiple story lines, lots of nuance and considerable gray area. This time it’s Mexico that’s committed its top players to Confederations Cup duty. A tight World Cup qualifying race has led other managers to give their busiest players some rest. Panama, the USA’s toughest group-stage foe, went that route. As did Arena during the group stage. Fans and pundits wrestled over the names on the fringe of the U.S. player pool. Who made his case for further involvement in the fall? Could there be an unexpected World Cup contributor in the mix? It hasn’t often been about simply lifting the trophy. This Gold Cup has been a means, rather than an end, for many. We debate its importance, relevance, strength and scheduling. We wonder what U.S. soccer might get out of it. Those questions and conversations are informed by a perspective different from that of a current player. U.S. national team fans have celebrated five Gold Cup titles and if the sixth doesn’t come next week, they’ll have to wait only two more years for another shot. That's a luxurious long-view players can’t afford. Bradley, the captain, has one Gold Cup title on his resume. But it came 10 years ago. He was suspended for the final and was on his way with a younger USA team to the Copa América in Venezuela when Benny Feilhaber volleyed the Americans past Mexico. Dempsey and Tim Howard have waited 10 years for another regional crown. Altidore has never won a Gold Cup. Outsiders may imagine those titles come relatively regularly. For those in the locker room, it could be once in a lifetime. Numbers matter. And so that’s why Bradley, Altidore, Howard, Dempsey and Darlington Nagbe (along with goalkeeper Jesse Gonzalez, who’s not expected to play), were recruited by Arena following the Gold Cup’s group stage. A U.S. men’s program that’s claimed just five senior titles in 100 years of play should want to add a sixth. This tournament's group stage was forgiving. The Americans didn't need to be at their best. But the knockout rounds, which could include a semifinal against Costa Rica and then perhaps another final against Mexico, require bigger guns. Arena had the opportunity over the past couple weeks to get a look at some players and potential combinations. Now it’s time to chase a championship. The numbers on their shirts won’t make an impression, but these might: The four new field players plus Howard combine for 503 caps, 111 goals and 10 trips to the World Cup. Dempsey and Altidore are ranked second and third on the national team’s all-time scoring list and Dempsey, Bradley and Howard are among the top eight in appearances. Arena isn’t selling out to win this Gold Cup. He’s letting the USA’s European players take a break before their club seasons commence next month. But the manager is also done with experimenting. He saw 22 of 23 players in action during the group stage. From here on out, it’ll be the best 11 available. Those four, plus Nagbe, will be expected to lead the way. The expectations appear to be clear to the newcomers. Leadership isn’t always the same thing as mentoring, and results are paramount now. The long term can wait for a week. El Salvador finished 1-1-1 in group play and drew praise from Arena, who called it “one of the better Salvadoran teams I’ve seen in a couple years.” Los Cuscatlecos have beaten the USA only once in 22 all-time meetings. That win came a quarter century ago. But listen to the American players talk about El Salvador’s energy, pressure and comfort in possession, and one gets the sense that there are some genuine nerves heading into Wednesday’s game. Nerves appear before moments that don’t come around too often. And even the game’s most accomplished players rarely find themselves 270 minutes from lifting a major international trophy. Fans wear their traditional jerseys in the stands. They’re established on Arena's first-choice team. They’ll be involved in qualifying and, if successful, next summer in Russia. And they could be resting or helping their MLS clubs prepare for the stretch run. But instead, Dempsey, Howard, Bradley, Nagbe and Altidore are here to win the Gold Cup. Some trophies and tournaments may be bigger than others, but none are to be taken for granted.